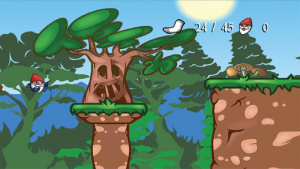 WiiWare first met the Gnomz four months ago with the release of the appropriately named Gnomz. This time they're back with a mission to rescue a princess — and bring back lots of socks. The game opens with the king blisteringly commanding you to do these seemingly disparate things, and it's a riot. The visuals and the soundtrack come together to create a sense of light-hearted urgency, and the writing is genuinely funny. Unfortunately this scene sets the high water mark for 2 Fast 4 Gnomz, and it's not one the game is able to rise to again. The cut scenes are truly the best part of 2 Fast 4 Gnomz, which takes its merciless interactive sections, seemingly, from the similarly brutal BIT.TRIP RUNNER. Like Commander Video, your gnome is propelled endlessly forward, and you will need to navigate obstacles, hop over pits and trigger switches to keep from dying, or from being crushed to death by the passing scenery. The challenge level hovers around RUNNER's difficulty, but the increased level count of 2 Fast 4 Gnomz allows it to ramp up more gradually. It also, however, leaves much more room for boredom and gamer fatigue to set in. The first issue you'll notice, and one that you'll never forget, is that the obstacles are not clearly delineated from harmless background elements. Brambles and tufts of grass look quite similar, but the former will kill you and the latter poses no threat. Similarly switches take the form of mushrooms, which nearly always look the same as any number of non-interactive background elements you've zipped past already. This is a poor design choice, and it leads to a number of surprise deaths that are neither clever nor satisfying. The aforementioned RUNNER did a great job of making its threats clearly identifiable, and the similarly quirky Tomena Sanner subverted the problem by making everything interactive. 2 Fast 4 Gnomz, however, splits the difference and comes out no richer for it. Sometimes things will kill you and sometimes they won't, and the only way to know where they are is to die and memorise it. That gets rather annoying. On the bright side, the respawn rate is impressively fast, and checkpoints are, for the most part, generously distributed, so death is more an irritation than an inconvenience. 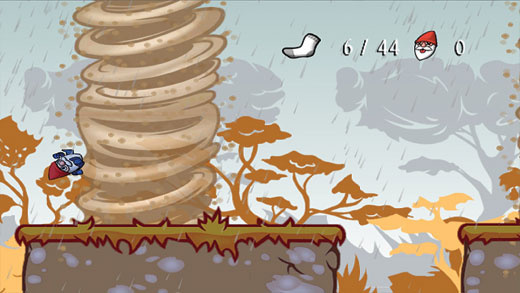 Throughout the levels you collect socks, and upon completion you can see how many socks you missed. 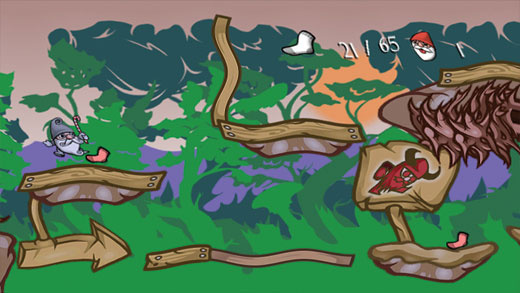 Scoring every sock in a level, however, doesn't net you any stamp or award of any kind, making the replay value minimal. You can also see how many times you died, but clearing a level with one life doesn't seem to affect anything either, which seems like something of a missed opportunity. The controls are decent, but can sometimes feel a little sluggish. We're not sure if that's by design, but we are sure that we don't like it. Jumping seems to occur a moment after the button is pressed, rather than immediately, and in a fast-paced game like this that often spells death. Also, if you hold the button too long your gnome will continue to bounce, which can also lead to death. It's an annoying feature that serves no purpose, and simply penalises you for not releasing the button immediately — something we're not sure warranted a punishment at all. As the game progresses you unlock additional moves for your gnome, which better help him navigate obstacles but which can also lead to some delightfully fiendish sequences that see you rotating through your abilities quickly and expertly. It's another page borrowed from RUNNER, but it's just as fun here as it was there. Visually the game looks great. It's vibrant and cartoony, and the cut scenes are a delight. The soundtrack consists of joyful, bouncy numbers that channel exactly the right atmosphere for a game of this type, so it's a bit of a letdown that the gameplay itself is the weak link. 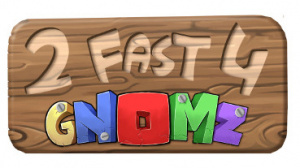 With loose controls and indistinct hazards, 2 Fast 4 Gnomz often feels like a Flash-based knockoff of a much better game. 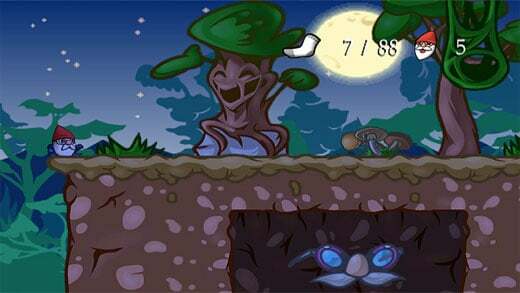 2 Fast 4 Gnomz doesn't have the most unique concept in the world — or even on the WiiWare service — but it does have a fun soundtrack and an oddly addictive charm. It's just a shame that deaths are more frequently the result of unclear visuals and gameplay quirks than any mistake on the part of the player. Those looking for a polished gaming experience should probably look elsewhere, but somebody itching for another non-stop platformer with forward momentum might well find something to enjoy here. You didn't mention the multiplayer! Is it the same as Gnomz 1? or is it more of a co-op game now? How does it stack up to it's predecessor? If QubicGames keeps it up they could make the most mediocre/average game series in the WORLD!! For some reason these gnomz games are appealing to me. But, I'll just have to let my passions go and get Mario Kart 7. For some reason, even knowing this game looks to be of mediocre quality, it just looks very fun. I normally wouldn't download a 6/10 game, but I might make an exception for this one. All the links in the article are broken. If the last gnomz had been 8-player it would have been an insta-buy. Sadly, it offered 8 players on the screen, only by making 4 of them cpus! Using the Driiift control method with one person using the Wiimote and the other the nunchuck would have made for some great chaotic fun. being just on WiiWare further hurts them. They should take single player games like this one to the 3DS eShop. Aaaaaaaaaaaaaaand the RUNNER theme is stuck in my head. What were we just talking about? I rather stay far away from anything that ends with a 'z' in a way like this. Catz, dogz, gnomz.. no thank you. I've never played Bit.Trip.Runner or any of these auto-run games, but this game looks REALLY awesome and like a heck of a lot of fun to me. I may actually pick this game up sometime. 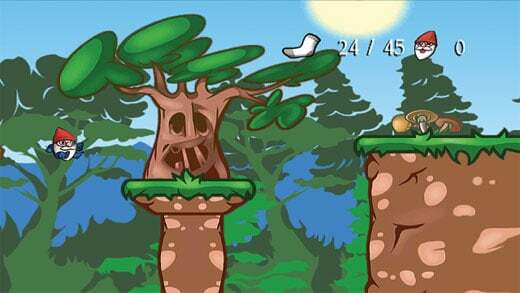 Think I'll write an article about these Gnomz games on my website, they seem like the type of hidden gems that few know about but that can offer quite a bit of fun if you go into the games knowing what to expect. Thanks for the great review! I have a Demo for 2 Fast 4 Gnomz! It is awsome! Great review. Got the demo on my Wii. It's a fun non-stop platformer, although I'm not so sure it justifys the price tag when you can buy Bit.Trip Runner instead.